If you are looking for a wedding or engagement photographer in the Huntington area, I would love to be considered to be your photographer. I am based in Babylon, and I am very familiar with the Huntington area and its neighboring towns on the North Shore such as: Lloyd Harbor, Northport, Centerport and Oyster Bay. I also have over 15 years of experience and can make the shyest subject feel at ease and love the way they look in photos. My approach is to keep things natural with a touch of romance, so that ultimately you will feel and look like yourself in your photos. 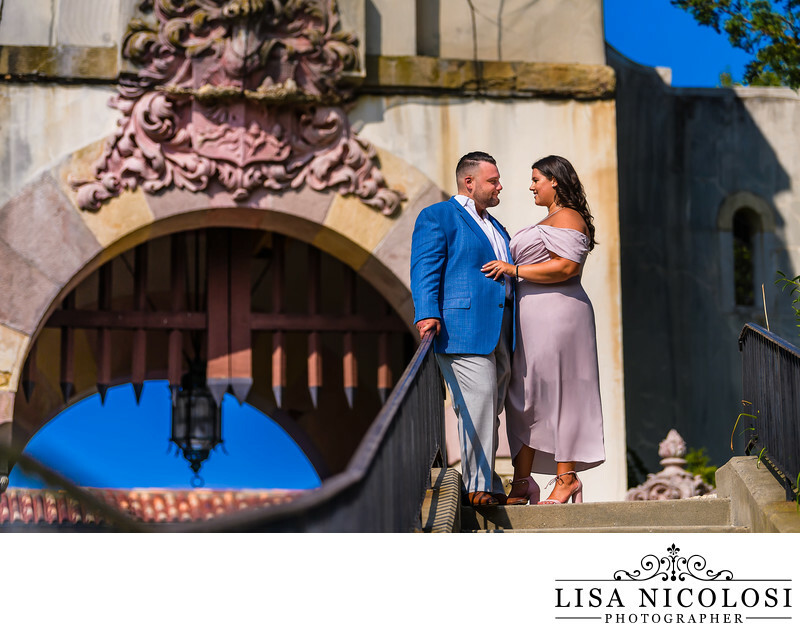 There are several location options to have an engagement session or wedding portraits within close proximity to the Huntington area. Some locations require a permit and a fee. These requirements will need to be arranged before your actual engagement session or wedding day. Always check in advance if any of these locations has had any changes to their permits, fees and parking rules. 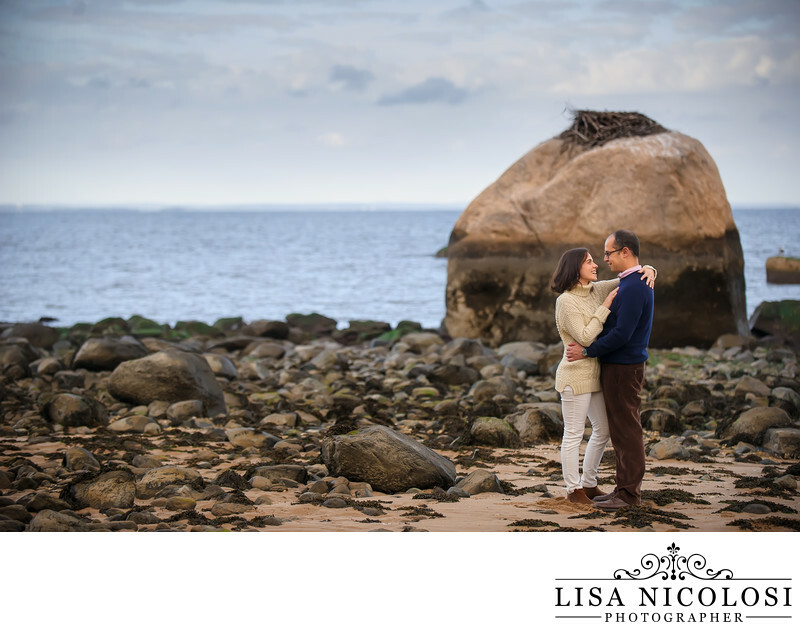 This engagement photo was taken on Lloyd Harbor Road in Lloyd Harbor, a pristine peninsula with water views, marshes and ospreys nests. Caumsett State Park and Target Rock Wildlife Refuge are just several miles up the road. I love when couples want to personalize their engagement session. This groom is also a musician and he brought his guitar and sang a beautiful song that he wrote just for his bride when he proposed to her. I love the romance in this image as they connect with each other and not the camera, thus becoming a beautiful moment they are sharing. Some of these locations are vast, such as Caumsett or Target Rock; it will depend on how far you want to walk during your session. The couple below was adventurous and did not mind the 2 mile walk from the Target Rock Wildlife Refuge parking lot to the shoreline. It was definitely worth it though, as this boulder makes for a unique backdrop for any nature lover. In order to see these large boulders you must plan your session at low tide. If you are planning a more adventurous session that may include lots of walking, wear appropriate foot attire and outfits that work well in that type of scenario. Certain locations have a more rustic vibe, like Caumsett State Park, as seen in the photo below. 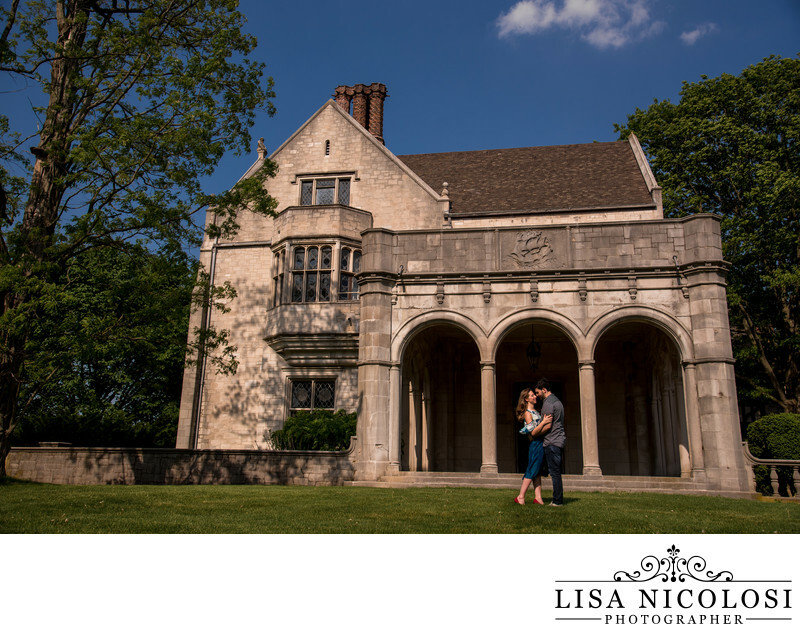 If you prefer photos in dressy attire, I recommend the Vanderbilt Museum in Centerport or The Planting Fields Arboretum as shown in the photos below. If it should rain on your engagement session day - check in advance if the place you are considering choosing allows rescheduling. If it should rain on your wedding day, some locations; such as Vanderbilt Mansion do allow indoor shooting. Some locations have porches and overhangs that will allow you to remain protected from the rain but still have some outdoor images too. It is always wise to think of these things and plan accordingly as weather can be unpredictable. Becoming engaged is an exciting time in your life and one that deserves to be documented with gorgeous photos. Once you get married you will probably never find the time to have a portrait session. Life goes fast, you are young only once; lock in down with beautiful photos you won't regret it. I would love to hear from you about your engagement and wedding plans and create beautiful art together! And have fun doing so too! Please visit my contact page or give me a call at 631-747-5645.